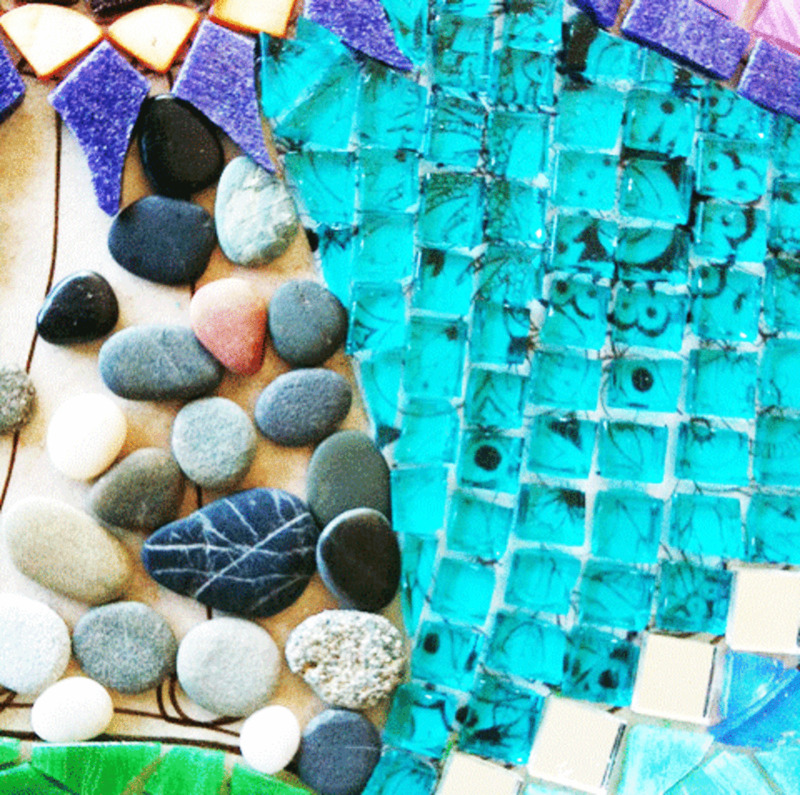 Learn how you can make your own mosaic bird baths, tabletops, gazing balls, flowerpots, stepping stones, and more. 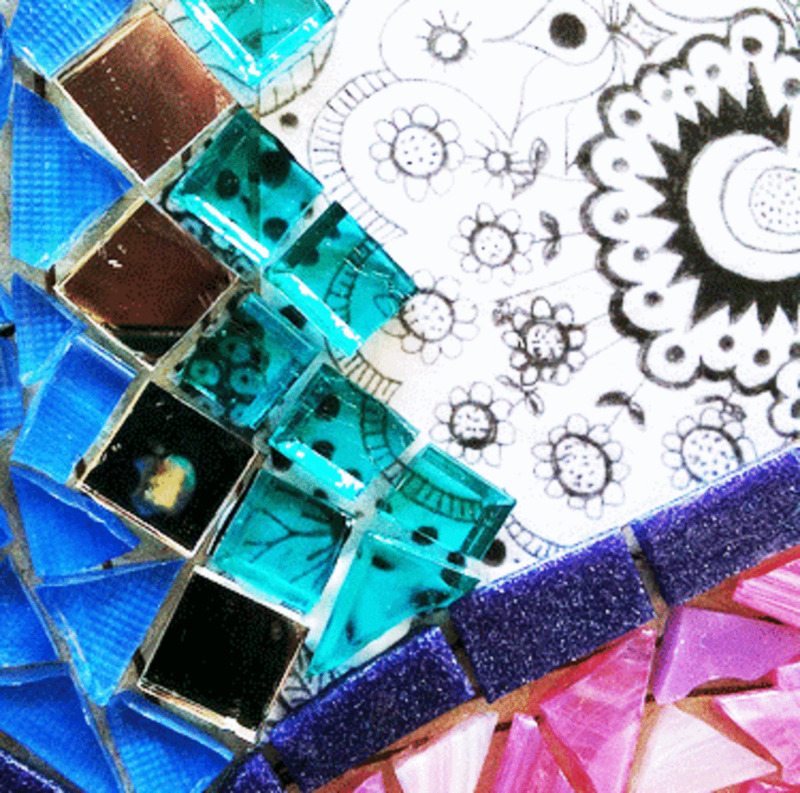 Find out what materials are needed, what methods are best for completing each mosaic project and how to find inspirational designs that fit into your lifestyle. 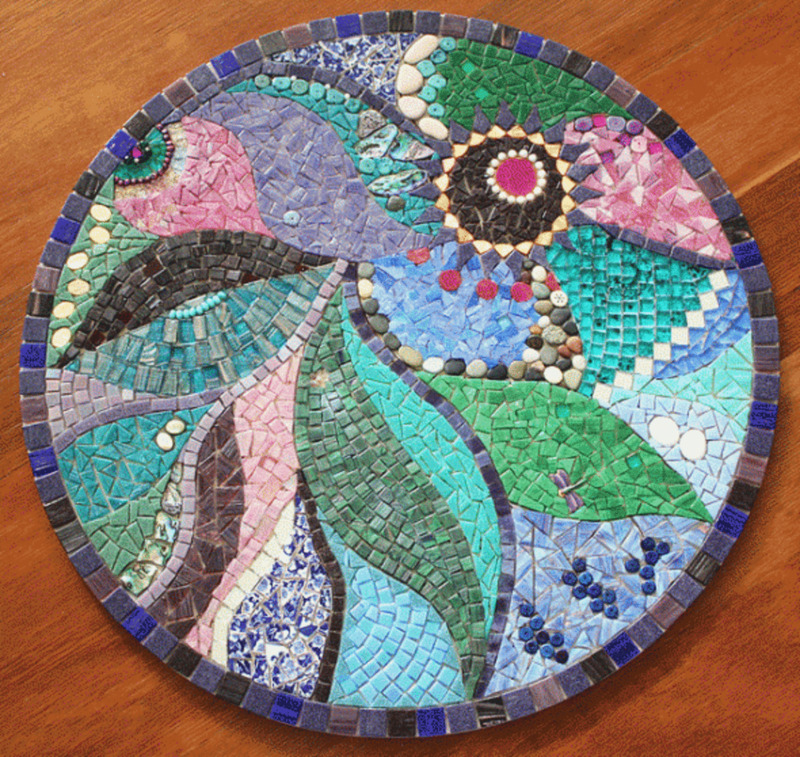 The most popular technique is referred to as the "direct method" which works well for crafting outdoor mosaic art be it a stepping stone or a table top. I will demonstrate the ease of this method so as to give you a good background on how easy mosaics are to make for yourself, to sell, or give as gifts. ...the surface on which the mosaic pieces are adhered. 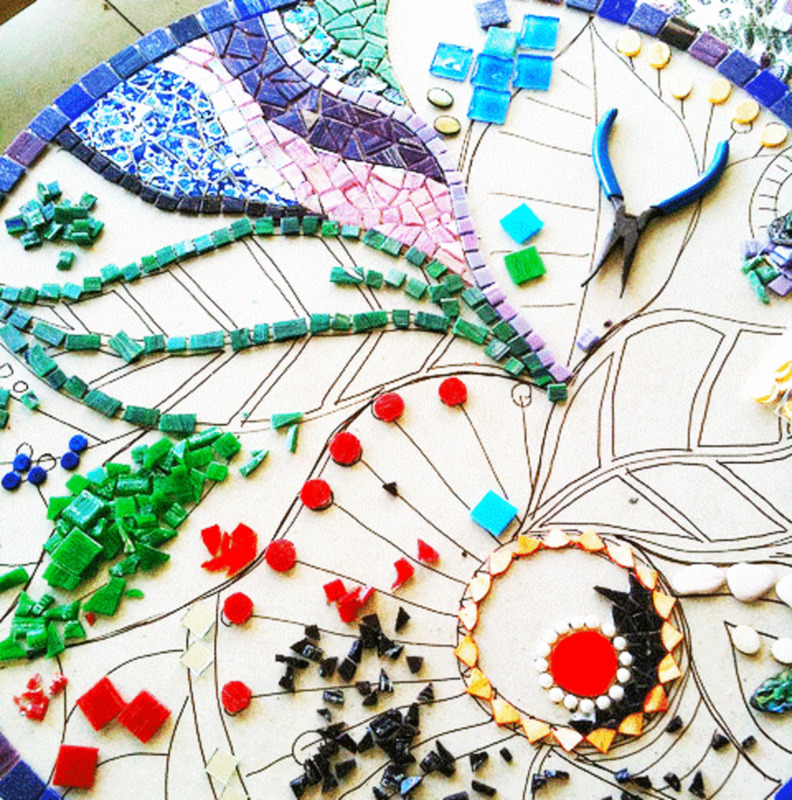 ...the decorative items used to create the mosaic design. ...a thin mortar pressed into the spaces between tesserae to consolidate the mosaic objects into a solid mass. ...adhering each piece of tessera directly to the substrate. ...adhering the laid out mosaic design to a back mounted mesh or surface mounted adhesive paper or film first before being adhered to the substrate. 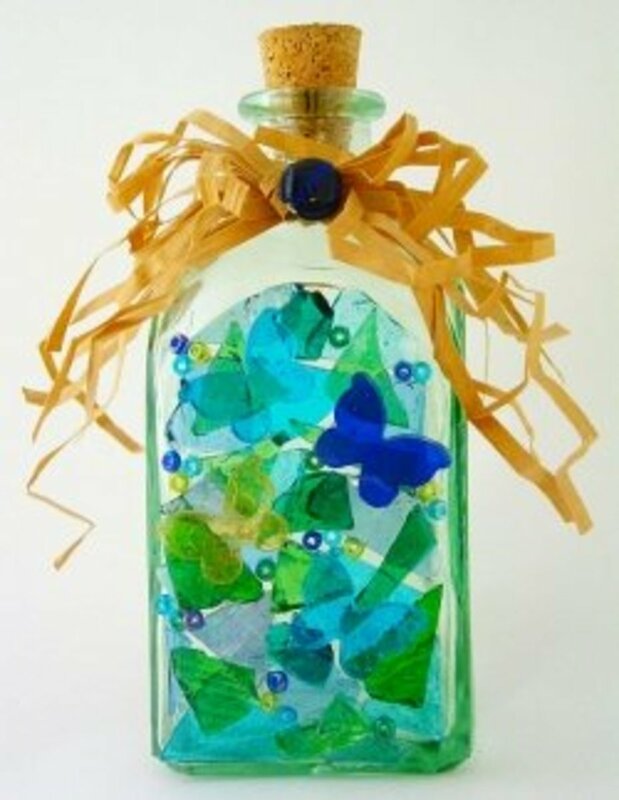 If you have never made a mosaic, a stained glass stepping stone makes a great introductory project. Not only are they simple to craft you will end up with a beautiful decorative walking stone for your garden to enjoy for years to come. I have written three tutorials using three methods for making mosaic stepping stones that I would like to share with you. 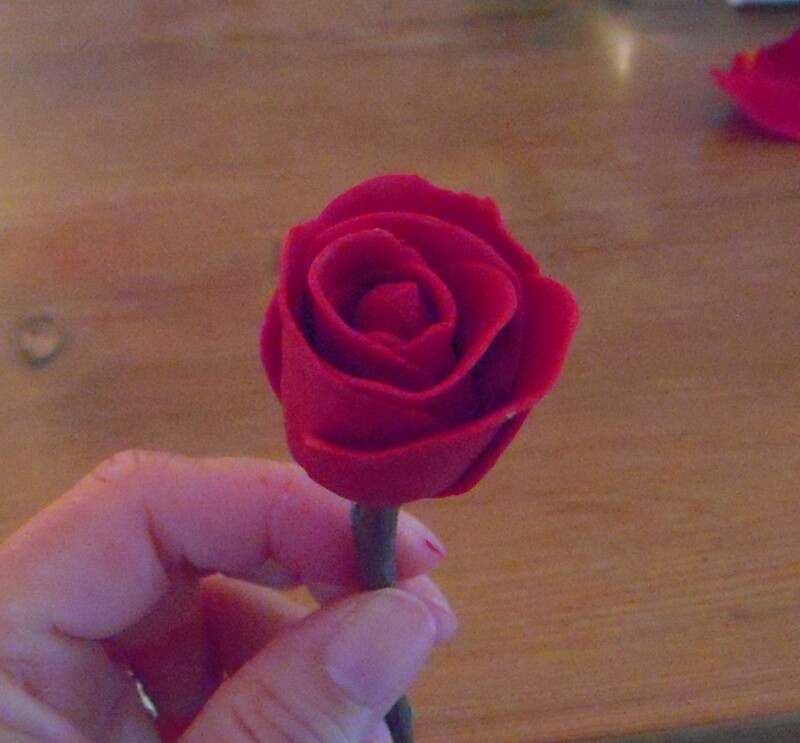 All three tutorials have complete directions with lots of photos and videos. 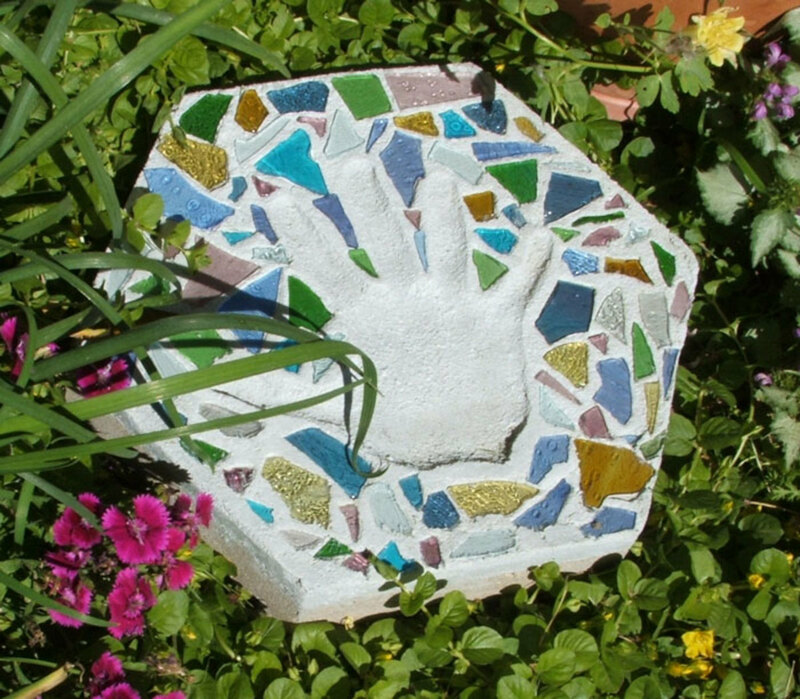 The first lesson makes an inexpensive simple stepping stone using stained glass cobbles and your hand-print to craft a personalized stone using the direct mosaic method. For the project you will need a precast cement stepping stone to which you apply your tesserae and impression. Very basic with a but of messy fun. The second tutorial teaches the indirect method of laying out your mosaic design on clear adhesive contact paper then pouring a concrete mixture over it inside a prepared mold. Also very simple with the advantage of being able to have a more detailed mosaic as well as a smoother level finished surface. The third tutorial is a complete lesson in the direct method, from making your own cast stepping stone to decorating it with your tesserae. Stained glass gazing balls are not only beautiful in a garden they are mesmerizing. As the sun travels throughout the day and the moon at night the reflections off the glass sprinkle a bit of magic in the air. Romantic, spiritual, whimsical are just a few of the words commonly used to describe the dazzling presence of a gazing ball. Crafting a gazing ball using the direct method makes it easy for even first timers. Adhering small pieces of glass, pottery, seashells, mirror, charms, or whatever else you might want to use will take a bit of time (like working a jigsaw puzzle) but well worth the effort. Before you start your mosaic make sure you have all of your tesserae close at hand plus have a design in mind. 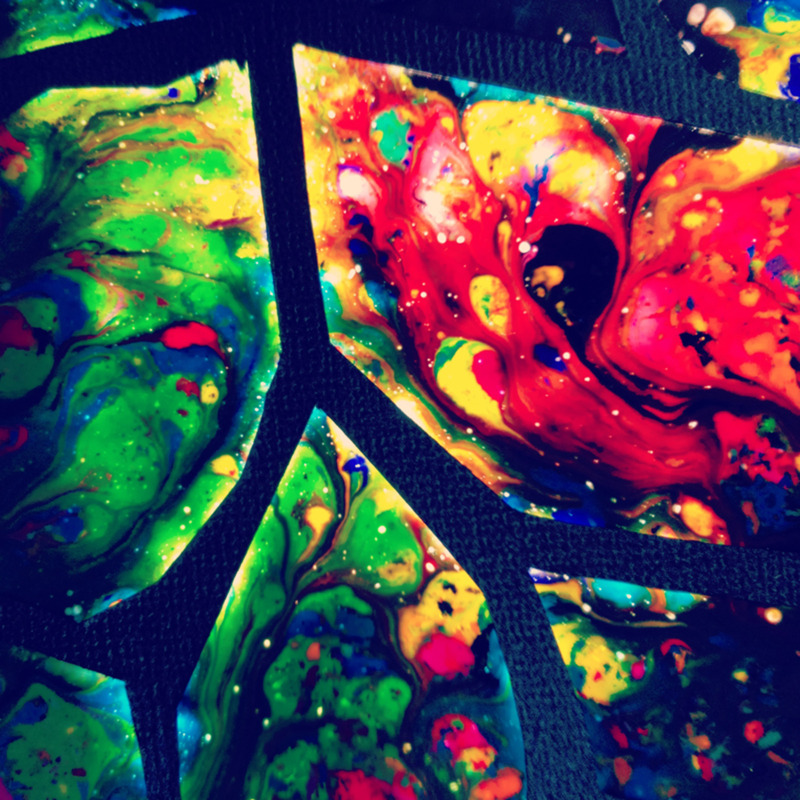 The ball is your canvas the tesserae your paint. Below is a video showing how to mosaic a bowling ball as a substrate for making a gazing ball. Bowling balls make a wonderful base, but make sure that you first "rough up" the balls smooth surface using sandpaper to give the best adhesion for your tesserae. Fill the holes with silicon caulk and let dry before starting to mosaic. Other substrates you can use are Styrofoam balls, plain glass gazing balls, or extra large acrylic ornaments. These two gals are definitely having fun making this gazing ball using a yard sale bowling ball they found. Old used bowling balls can also be purchased from bowling alleys. Make sure to scuff up the smooth surface before adhering your tesserae! A beautiful addition to your patio or as a gift, mosaic garden pots are another great way to show off your mosaic skills. Be it a simple patchwork design or a more intricate pattern. Below is a short tutorial on how to use the direct mosaic method on a flower pot. What is not mentioned and should be remembered is that terracotta pots are considered to be "absorbent substrates" and need to be sealed with either a tile sealer or a mixture of 1 part white glue to 2 parts of water before your tesserae are applied. Do not use a waterproofing sealer because it may not bond with your adhesive. Sealing the pot prevents the adhesive and grout from drying too fast which could cause cracks in your grout later on. This adorable and simple bird bath is made using a 12" terracotta saucer that is set on top of two large flower pots that form the base. 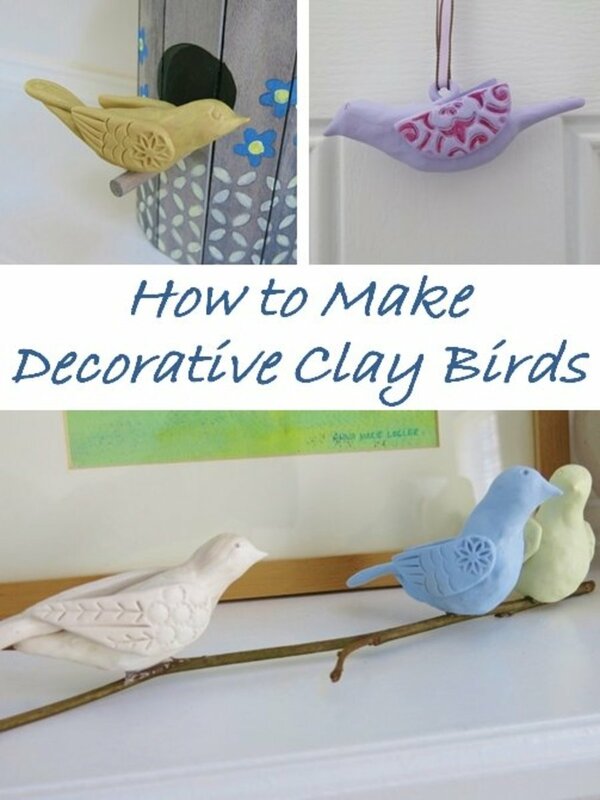 Birds and Bloom Magazine has a wonderful tutorial for making this simple but beautiful bird bath. To make the base a bit more "artsy" how about a band of tiles added to each of the pots bases forming a "belt" around the middle. You can also use the direct mosaic method on precast cement bird baths. If there is one really awe inspiring piece to make for your garden patio here it is! Start small with a side table to practice your newly found skills then go for the gold. Below check out the pictures of a table top during its steps to final creation. Table top substrates that work well with mosaics are glass, concrete, waterproof or water resistant materials such as backer board or concrete board. Avoid using materials that bend or warp such as particleboard, thin flexible metals, and some plastics, these can over time can cause the grout to crack and the tesserae to come loose. Additionally wood substrates are better for interior projects. 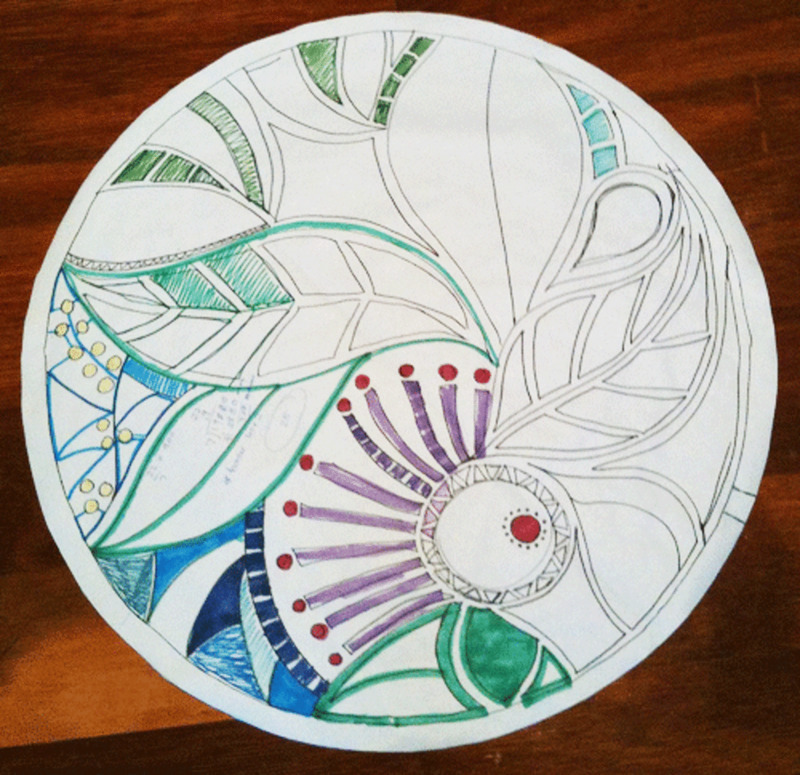 Template design of the tabletop mosaic, a full size drawing. 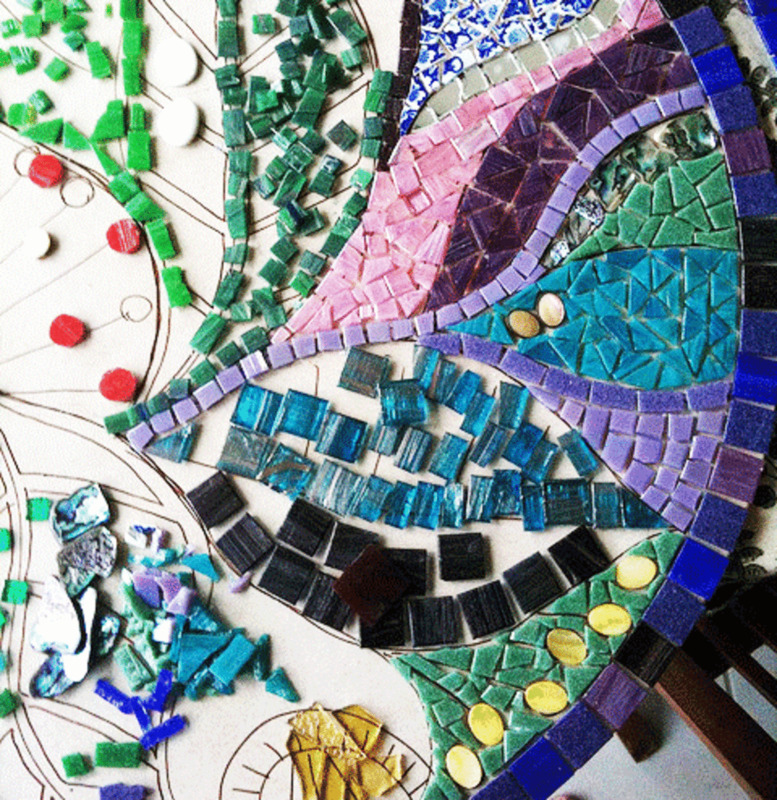 The artist used the original plate glass tabletop as her mosaic substrate. 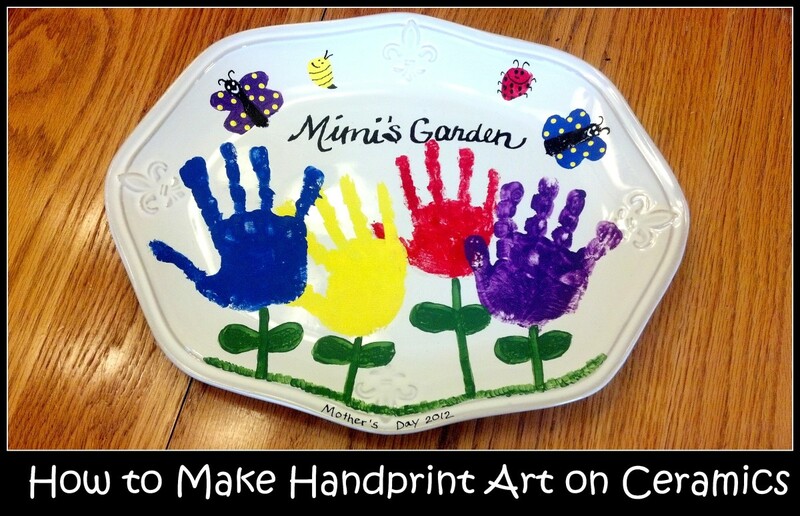 It was placed on top of her template to give her a pattern for her glass on glass mosaic. The border was laid first to insure a perfect fit. 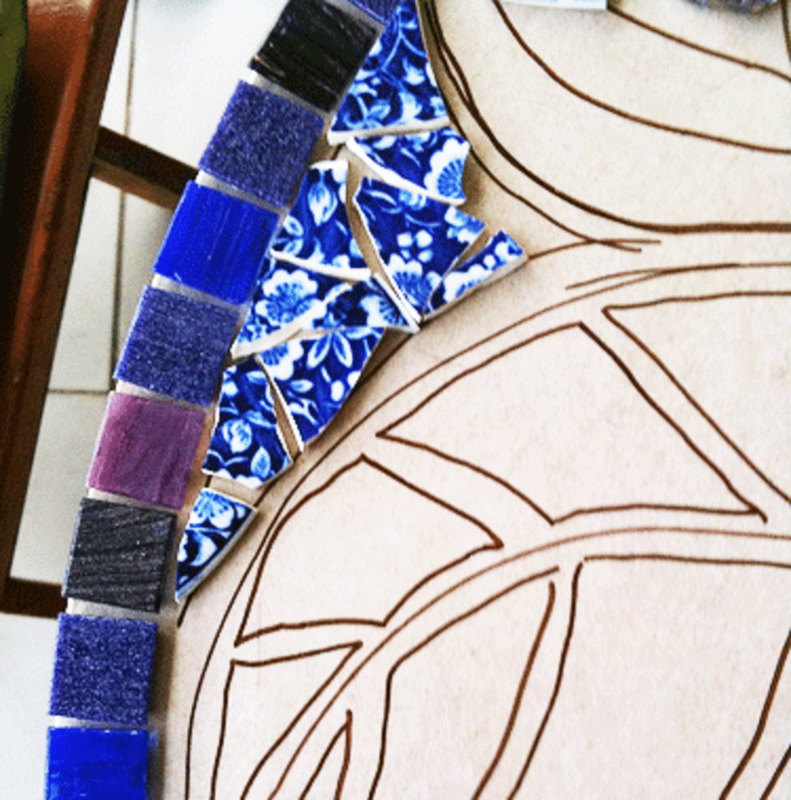 Laying out the glass pieces (tesserae). The glass outlines are first to be glued to the glass substrate. 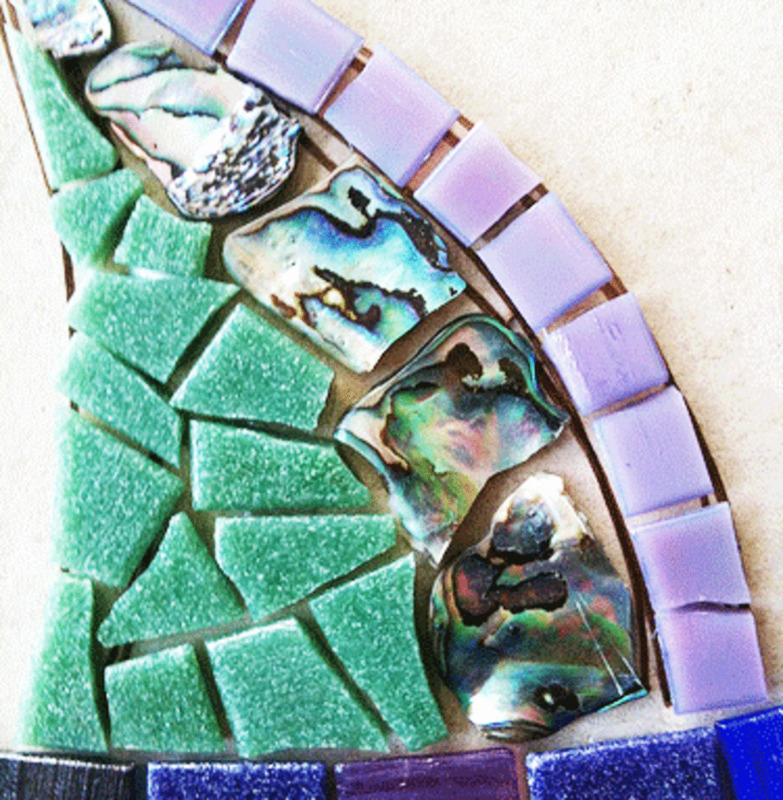 Along with glass tiles and cut glass, the artist used abalone shells, jewels, broken pottery and stones in her mosaic. Close up detail of her work. Laying out the stones for final placement before adhering. Notice that the artist used a decorated stone for added interest. Detail photo as the piece is being worked on. Once all of the pieces are adhered the finishing grout work will be applied. The finished table top...beautiful isn't it? 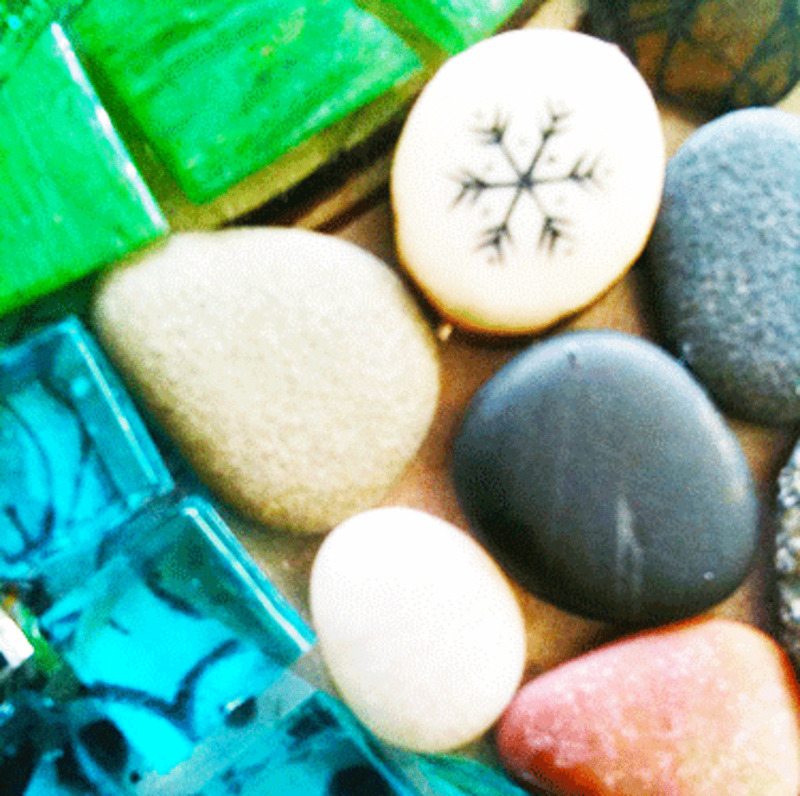 Glass for mosaics comes in a variety of sizes, shapes and thickness. It is important that you consider your finished piece before purchasing any of your tesserae. If you are crafting a table top on which glasses and dishes will be placed you will want a smooth, even no spill surface. You will need to choose tesserae with all the same thickness. 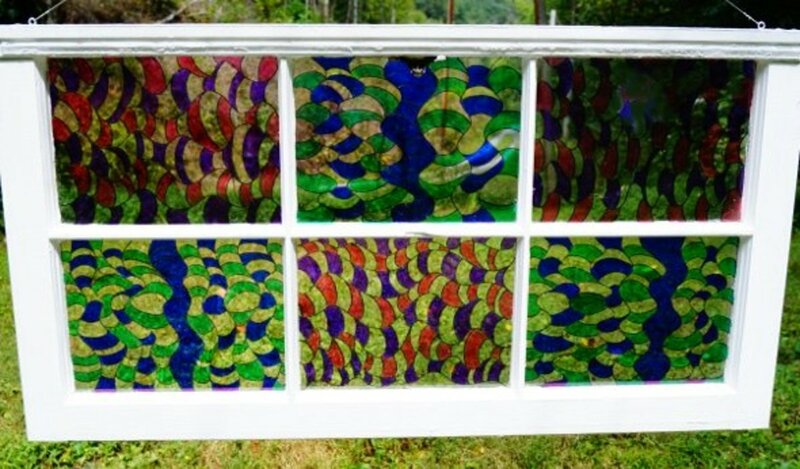 Stained glass is generally 1/8th" thick, however some of the heavier textures such as ripple can be significantly thicker, as can glass globs, molded glass shapes and jewels. Glass tiles are available in 3/4" and 3/8" squares. To break or cut them to size you will need a mosaic glass cutter. 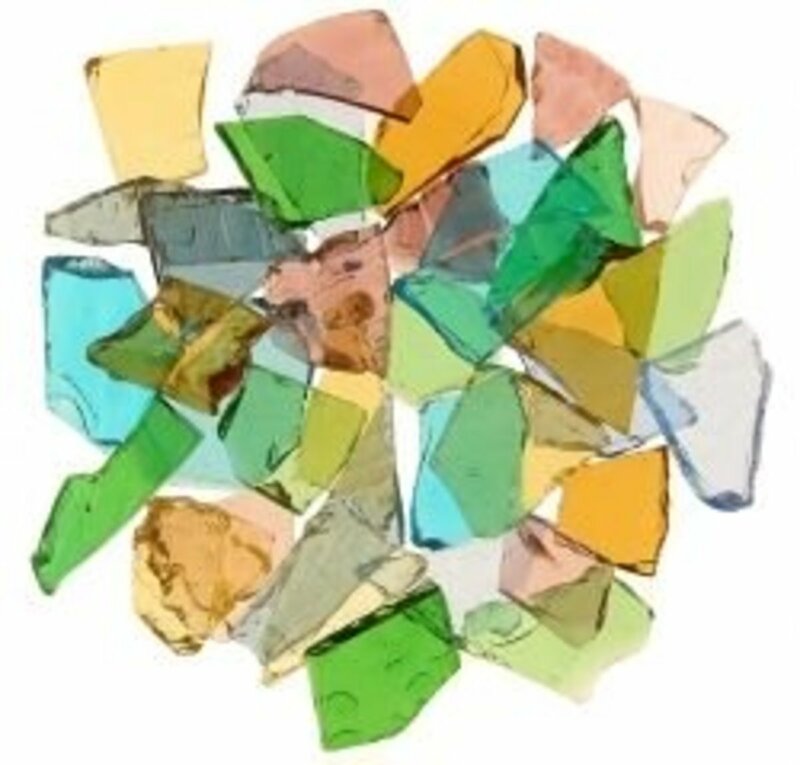 For your stained glass pieces you can purchase sheets of glass and cut or break your own pieces or purchase pre-broken glass (my preference) such as Stained Glass Cobbles. It is available in three size choices from very small MiniCobblets (sand to pebble sized), medium sized Cobbles (1/4" to 1" pieces, and large Cobbs (1 1/4" to 3"). The greatest benefit to buying Cobbles is that you purchase only that size that you need for your project. When breaking your own glass you end up with a lot of little sharp shards and pieces that are either too small or too big. 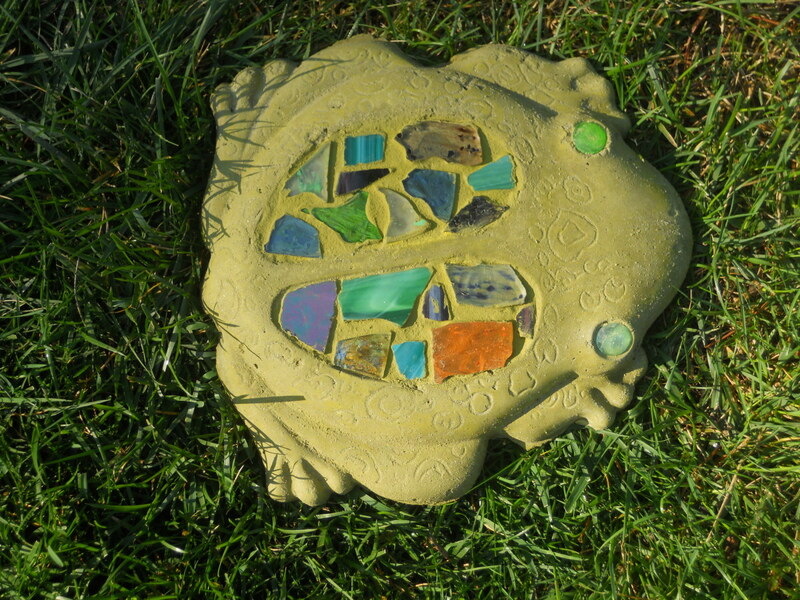 What do you use to seal terrecotta before mosaicing an outdoor bird bath? Then what type of adhesive for the tiles? Thank you. I love your projects - - I have done several of them in the past, but have not found them impervious to weather. I have tried several different glues, but still they fall apart after a season or two of rain. Any ideas? I am now inspired to make a mosaic bird bath. Thank you. I am in the process of making a mosaic gazing ball, I have poured a sphere out of concrete and have all of the glass cut, Just have to put it all together. I just got a concrete ball mold, I am going to pour it so I can make it into a mosaic gazing ball. The ideas you have are perfect for the look I am going for in my garden and yard. Thanks for sharing all of this great information. Stopping by to say wonderful once again! Terrific tips a d pointers. 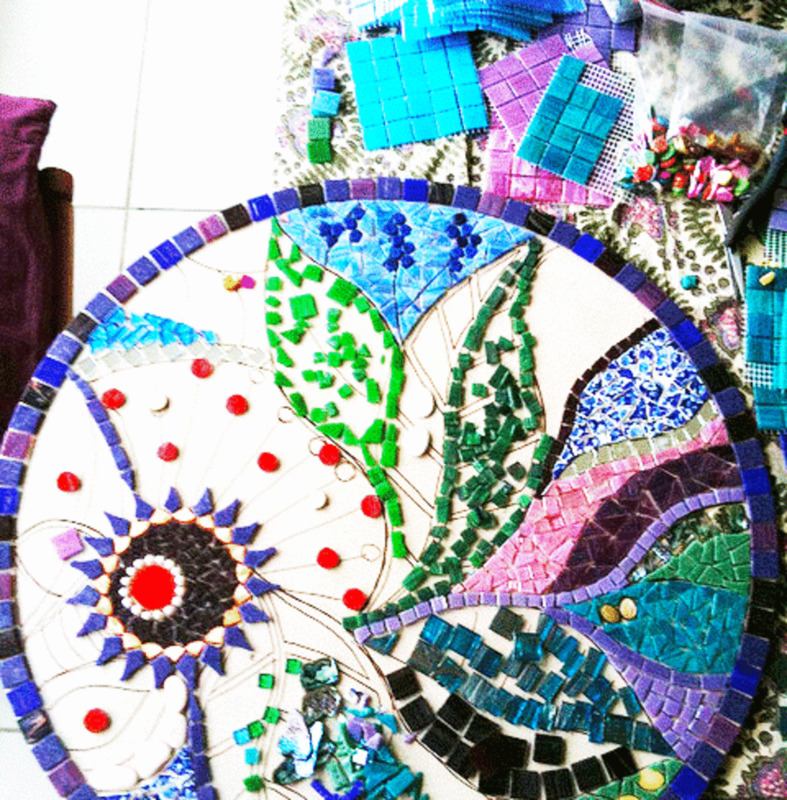 I do all sorts of art and craft medium and mosaic is something I have yet to venture into. This page here that you shared helps me envision doing mosaic myself. Thank you thank you! Fabulous Lens - you've inspired me to make stepping stone or two for our garden when summer eventually makes her long awaited visit to England! This would be a nice garden. Nice lens. I found this lens through your other lens about bottles. I repurpose furniture and have wanted to learn mosaic for my table tops! Definitely an inspiration, and lots of good info. Thank you for a gorgeous lens! These things are so absolutely beautiful! Mesmerizing! So beautiful...love it so much, especially the garden pot. The mosaic bird bath would fit perfectly under the tulip tree in our yard! Thank you so much for sharing! Love the gazing ball! Absolutely lovely! This is a beautiful basic explanation for someone like me who's never done mosaic before. Beautiful lens. We have a tabletop that was hand mosaic tiled by a relative, lots of work involved, but it looks fantastic. I've just started mosaicing and this is such a great resource. Thanks so much, so many ideas I can't wait to get started. This is something I want to try. Thanks for sharing. These mosaic ideas are just great. oh this was awesome! I am wanting to do a lot of these projects! I love your lens - this is what I call Eye Candy! Wonderful, wonderful.....and did I mention....wonderful! You have me wishing for a garden!